Bonnie and Gilbert Grape try to figure out why Arnie is running around on the front lawn rambling about being stuck in multi-layered dreams on the RMS Titanic. This movie takes place in a house in the American Midwest. The house is certainly lived in, and that’s apparent from the outside. Inside, things become complicated. There are four kids, all at or close to adulthood. There’s Amy (LAURA HARRINGTON) and Ellen (MARY KATE SCHELLHARDT), but we don’t know much about them. We care the most about Gilbert (JOHNNY DEPP), and how he takes care of Arnie (LEONARDO DICAPRIO), who is mentally challenged and is about to turn eighteen. The father killed himself many years ago, and his wife, Bonnie (DARLENE CATES), fell into depression and compulsive overeating which leads her to be more or less physically unable to leave the house. She doesn’t want to leave, either, she’s too afraid of what people might think. That’s all you need to know about What’s Eating Gilbert Grape, an efficient, atmospheric drama directed by Lasse Halstrom. It captures a mood early on and doesn’t let go. I like it when a movie can find it’s proper mood and stay there. The characters are convincing as they are written, no matter how minor, and the acting put into them solidify their existence. DiCaprio’s portrayal of the mentally disabled kid Arnie, is convincing – very much so. The character of Gilbert, which requires a deep understanding of the actor having someone dependent on him, is well played by Johnny Depp. And the morbidly obese mother is played by Darlene Cates, who had little previous acting experience before this. It is clear that when she exits the house at one point and is ridiculed by the residents of her small hometown, the pain she expresses is drawn from personal experience. 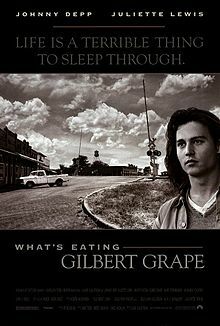 Regardless, What’s Eating Gilbert Grape is a very good movie. Well, it’s a different kind of good movie. What I mean by that, is that most good movies you’d have no problem watching again and again. I’ll say that this one is different. It’s admirable drama, but I’m venturing a guess that it won’t work on repeat viewings. It depends on the audience knowing nothing about it from the start. By saying that, it’s not degrading the movie, it’s just pointing out the fact that a story like this works best when you don’t know what’s happening next. Simple as that.